A sovereignty debt crisis is when a country (as opposed to a business or other organisation) is unable to pay off its debts. If they cannot afford the interest payments and their credit rating is lowered substantially, then this could trigger a debt crisis. Debt crises have many ramifications, including lower economic growth and a period of austerity. This doesn’t just affect the average citizen, though; business owners would be affected by a debt crisis too. The Eurozone may be headed for another debt crisis and, unfortunately, this isn’t good news for companies based in the EU. The financial uncertainty in countries such as Italy, Greece, Spain, and Portugal could extend to the Eurozone as a whole. As governments in the EU aim to save (and make) more money, businesses could be affected by increased taxation as a larger portion of their revenue must be used to pay taxes. There may also be lower subsidies available, meaning that certain businesses (such as those involved in an energy sector) may suddenly lose a funding channel. If the overall domestic sector is in trouble, then banks may offer less favourable lending conditions, which will also negatively affect a business’ bottom line. There are some potential advantages for businesses, though. If the Euro becomes much weaker against the US Dollar, for example, then there will be a major benefit for Eurozone businesses that export goods to the US. The EU/USD exchange rate makes it cheaper for US firms to buy goods from the Eurozone than from other regions, making the transaction worth it. However, companies will experience disadvantages if they have to import raw goods. A weak Euro would buy them less when buying from other countries. What Can Businesses Do to Address This? 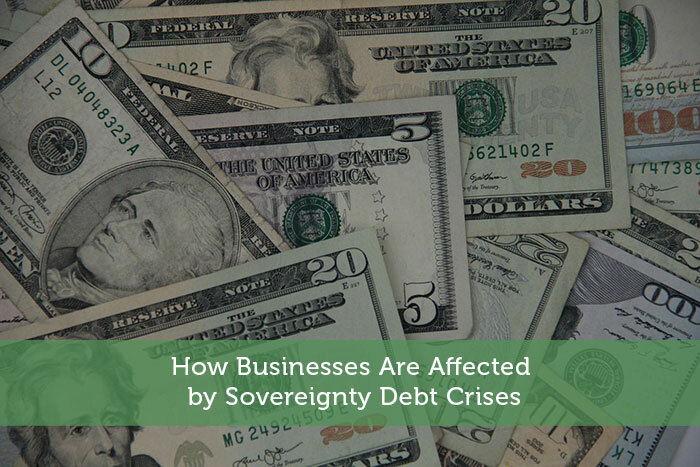 One way that a business can prepare or deal with a sovereignty debt crisis is to vary its finance channels. If your business heavily relies upon those government subsidies, or if you are counting on loans from the bank to make investments, improve your products and more, then you’ll want to change that. Some funding sources for small businesses include finding an angel investor who evangelizes about your product and is happy to put a lot of capital behind it. If you have a passionate fanbase – or a tuned-in demographic of potential consumers – then you’ll want to consider crowdfunding. Venture capitalists are tougher to appeal to but may provide more money. In the EU, there are also programmes such as the capital markets union, which aims to make more funding sources available to small and medium-sized businesses in a more accessible way. They are designed to make financial markets more resilient in the event of a debt crisis. The EU is hoping to launch this in 2019 but, as of the time of writing, it isn’t ready. The takeaway from this is that debt crises do matter, both to the average person and to businesses, and that they cannot be ignored. While it may seem complicated and complex, you should take notice of it.